My paternal grandmother, Sarah Ellen Liechti, nee Barker, stage name Nellie Banks, was a seaside concert party and variety artiste for a number of years in Brighton and elsewhere, performing as singer, dancer and comedienne. I have numerous publicity postcard photographs showing her in various troupes between 1916 and 1932, and other individual showbiz publicity shots that date back as far as her 15th birthday, 1907. 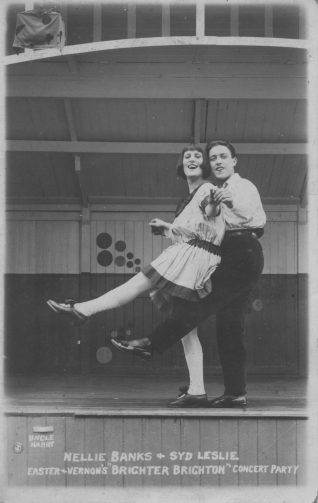 The photographs here are from what appears to have been an extensive engagement with Easter & Vernon’s Brighter Brighton Concert Party, and are dated 1924. 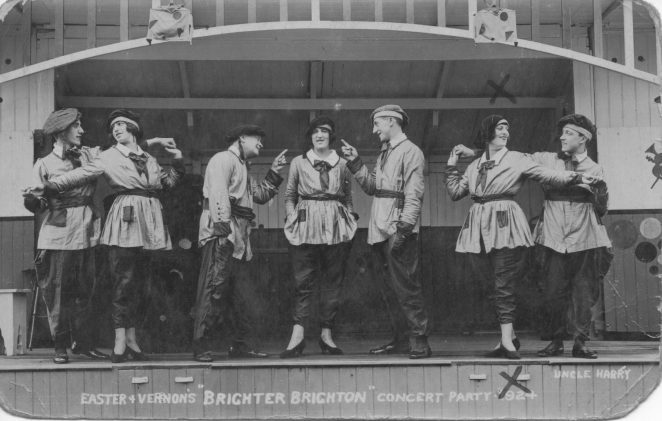 It is possible that Easter & Vernon maintained two ‘Brighter Brighton’ concert parties in the town; you can read more about them here. I have a sheaf of correspondence from Sarah to her husband, my grandfather Ernst, from the period 1922-25, postmarked at various south coast towns, and also some inland locations such as Burton on Trent. These letters imply that my grandfather may have been a very early ‘house husband’, looking after my father and his younger brother at home in Springfield Road, Brighton while his wife was away earning the family’s living. However, my grandfather was also a waiter at the Royal Albion Hotel and later the Metropole, and for a while also ran a tobacconist’s shop in Cannon Street, so the boys may have been in the charge of a carer much of the time. My grandmother died in 1985, but she was still active as a part-time performer in Brighton pubs and clubs until at least the mid-fifties and well-known around the town as a “character” for years afterwards. 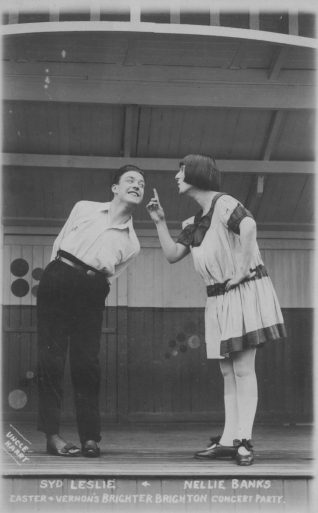 If any visitors can remember Nellie Banks, or have any more information about the Brighter Brighton concert parties, I would be very interested to hear from them.